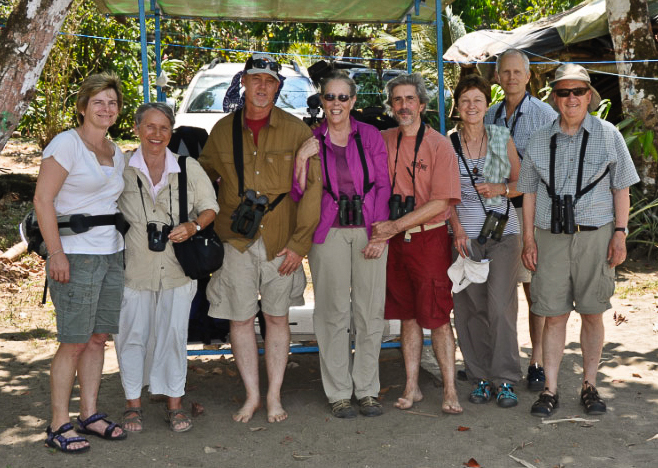 Eight members of the San Vito Bird Club took a three-night trip to Las Caletas Lodge, just south of Drake Bay on Costa Rica’s famous Osa Peninsula from February 24-27. Fred and Jean Schroeder, Michael and Alison Olivieri, organizer Julie Girard and her husband, Dave Woolley, and my husband, Harry, and I enjoyed a marvelous get-away with unexpected good fortune. Part of the felicitous luck was owed to Jim Zook, ornithologist and bird guide extraordinaire, joining San Vito Bird Club members for the fourth consecutive year of the club’s annual outings. After an early morning departure from San Vito, we stopped en route at a junction near the town of Rincon, where a new bridge offers a wide vantage point over the Rincon River. 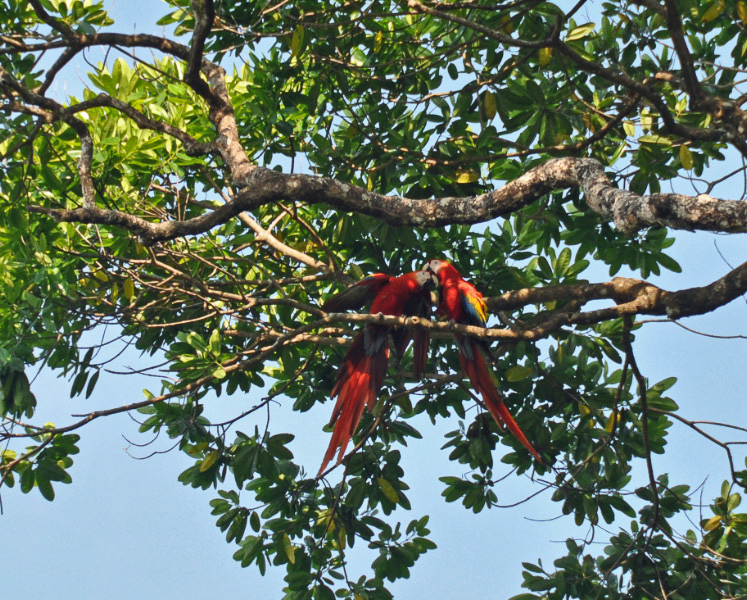 In just minutes a pair of Scarlet Macaws flew and squawked overhead, and soon thereafter we were delighted by a coveted sighting of several Yellow-billed Cotingas doing some aerial gymnastics over the towering trees on both the lowland side and the forested hill next to the river. 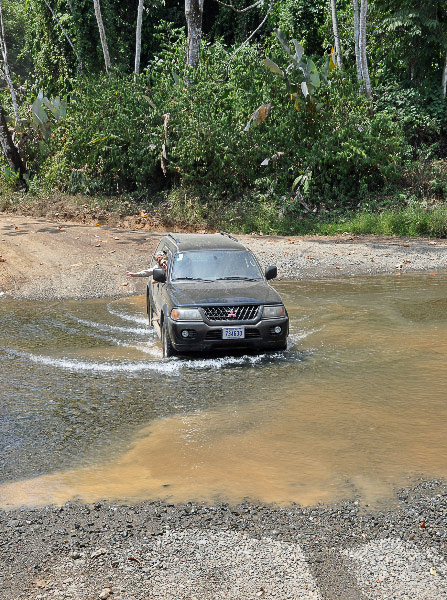 The gravel road from Rincon to the village of Agujitas on Drake Bay is in very good condition, but it can only be driven in the dry season due to various creeks that must be forded. The trip took less than an hour. Las Caletas Lodge arranged the boat pick-up at the Agujitas beach, where we left our cars. 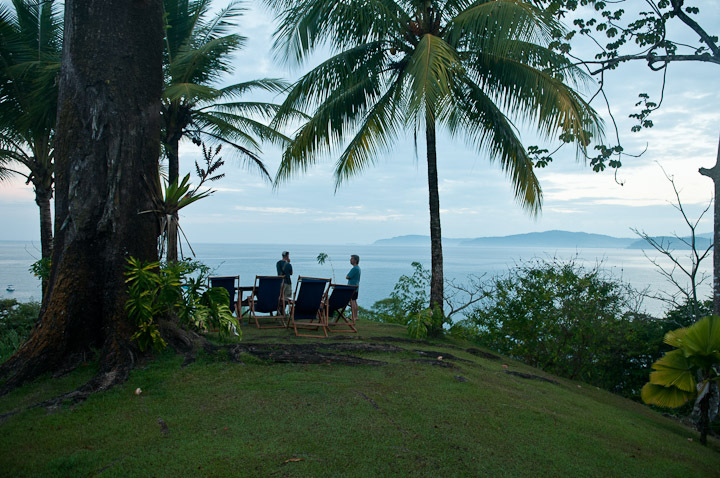 It is just a 10-minute boat ride to Las Caletas beach, and a few minutes walk to the hill-top rustic cabins. After lunch in the Lodge’s family-style dining area, we spent the afternoon settling in and enjoying the vistas and rich bird life right on the property overlooking the Pacific to the southwest and the coastline in the distance to the northeast. 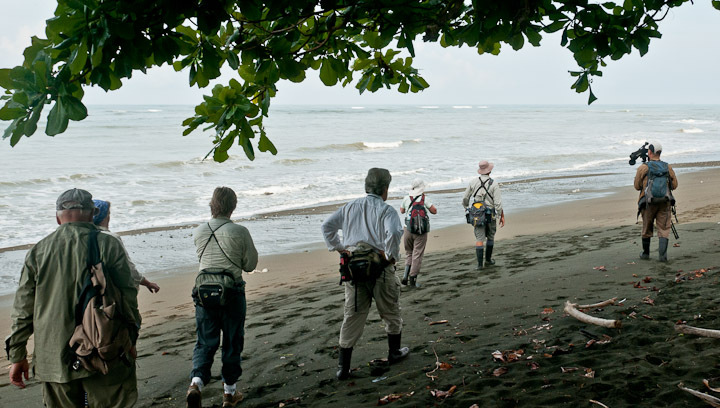 On Day Two most of us opted for the main event of the trip—a visit to renowned Corcovado National Park (CNP), a wildlife refuge large enough to sustain populations of jaguars and tapirs, as well as the more common mammals. After a dawn breakfast, eight of us took a fast boat almost an hour further south to a beach near the La Sirena entrance to the Park, pausing en route near some off-shore rocks where we saw Brown Boobies and Brown Pelicans. Then, upon arriving at the rocky beach at La Sirena, we saw a Whimbrel, Ruddy Turnstones, a Least Sandpiper, and at least one Spotted Sandpiper among other shorebirds. Fortunately, we were joined by José Huertas, our Lodge’s resident naturalist guide, who was familiar with the trails of CNP. Very dry conditions prevailed, as they do over the whole Pacific region in January and February, but the rain forest habitat of primary and transitional secondary forest did not disappoint. 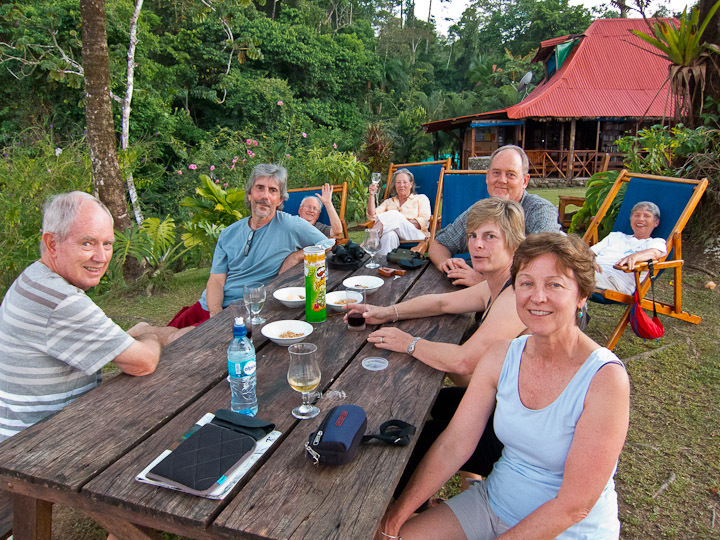 Some of the high points for birders were the Long-tailed Woodcreeper; a Great Curassow, making its strange, deep and loud humming notes; a Common Potoo, cryptic but unusually active at its very high perch; a Great Tinamou; Baird’s Trogon; a Double-toothed Kite carrying nesting material, and a group of Tawny-crowned Greenlets. (See below for complete bird list.) 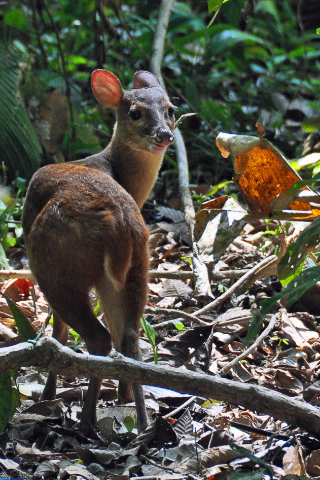 Before the end of the walk we also saw two unexpected mammals—an adult Red Brocket Deer, about the size of a large dog; and oh-joy-of-joys, an adult Baird’sTapir. For many of us this was a thrill beyond compare. The tapir was snoozing in a muddy creek bed, cooling off under forest cover barely 50 yards from the beach. The sudden fall from a tree of a scrapping White-Nosed Coati, of which there were a half dozen or more between us and the tapir, woke the hippo-like tapir from its nap, and we were able to get some photos of its face from a safe distance. These animals can be dangerous, as are hippos, if one finds oneself between a mother and baby. During the four-hour forest walk we had also seen many Howler and Spider Monkeys. On the way back to Las Caletas after our picnic lunch, we enjoyed the company of dolphins swimming along off the bow and either side of the boat. Our afternoons were relaxing, and the birding on the lodge grounds was superb. Imagine lounge chairs, hammocks, views of distant cruise ships, rainbows, cumulous clouds and a constant variety of bird species flying into and out of trees on all sides. A Scarlet Macaw pair preened and then did falling somersaults in either a mating act or a playful tumble. The hummingbirds, such as the Charming Hummingbird, kept us entertained in the verbena bushes covered with flowers just a few feet away. Overhead in the Cecropia trees, a pair of Golden-naped Woodpeckers were busy hunting ants. 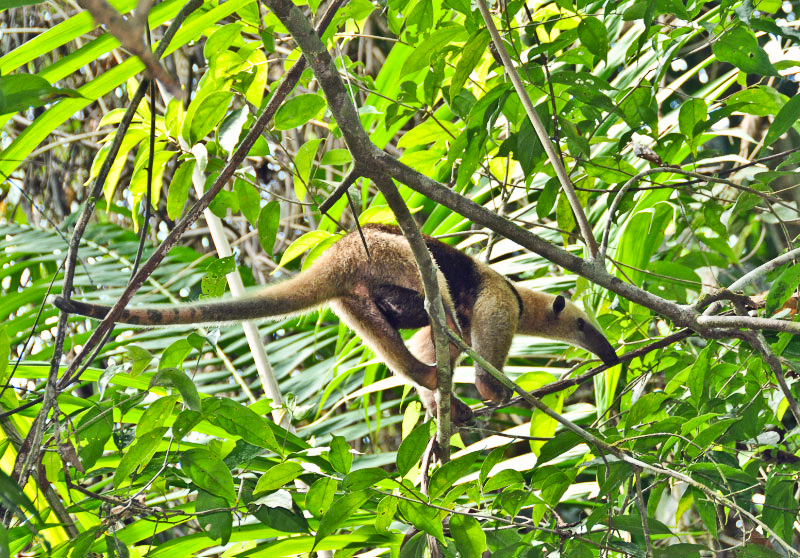 Julie Girard was the one guest who encountered a Northern Tamandua (anteater), another exciting and uncommon sight, just about 25 meters from the Lodge. Julie did a super job organizing the trip, so she deserved this extra reward! This was a perfect trip for both very experienced birders and some of the rest of us who are not exactly gifted practitioners of the art. All were very amply rewarded for their patience and passion for feathered friends as well as four-legged creatures.